Prom Print Digital have more than twenty years’ experience printing between 100 and 120 jobs each month, from business cards to 32pp brochures. That’s a lot of files in all sorts of formats, and it’s made us good at anticipating issues and solving the problems involved. 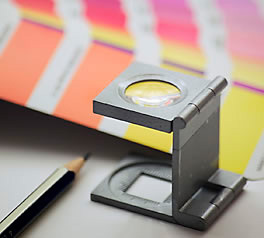 Our digital press can print onto a wide range of papers, films and self-adhesive materials from 80gsm up to 400gsm. To compete with the press performance and the opportunity for longer personalised print runs, we have added auto creasing to our in-house finishing along with booklet making, tab cutting, perfect binding, case making equipment and hot foil stamping. Fewer outsourced finishing activities means a tighter control over completion times. Digital means FAST – and 90% of our jobs are processed, printed, finished and despatched same day. With so many variables in the print process we don’t have a price list – our database accurately calculates data processing, personalisation, paper costs, and finishing on a per page basis, on a per job basis. We have many clients among the local design community, a number of corporate clients, and a growing number of local businesses who now buy their own print… all require a consistent and reliable service. Drilling, Duplexing and Mounting, Die cutting and kiss-cutting. Hard-back Casemaking, Perfect Binding, and Stab Stitching. Large quantities of Die cutting, kiss-cutting and laminating are all put out to specialist print finishers. An extra 24 hours should be allowed. Call us for more information about lead times. Standard SRA3 is the most common flat sheet size (with a maximum image area of 308x450mm, sufficient to print an A3 image with bleed and crop marks on all edges), or for 6pp A4 or A4 landscape formats we can print up to 660x330mm. 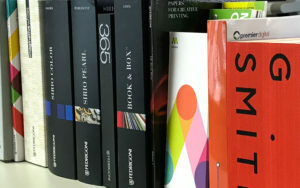 Most papers and boards are available from 115gsm to 350gsm, including self adhesive, recycled and clear and opaque films. WHAT’S MORE NATURAL than print and paper. It is the ever-present communications medium that can be re-used again and again. Print and paper has a great environmental story to tell. Each year in Europe, where 94% of the paper we use originates, the forest cover is increasing by an area four times the size of London, and more than 60 million tonnes of paper is being recycled! All of our House coated stock (Gloss and Silk) is 50% recycled and 50% FSC approved.